The Rekola AddOn work belt comes with diverse textile bags that are attached to an adjustable belt by Velcro. This means the belt can be customized and/or personalized to the user’s needs. The smaller bags are color coded and the long bag is ideal for a duster or plastic bag roll. This belt is also suitable for Rekola AddOn EVA products with clips. The dimensions of the bag make it comfortable for employees of differing heights, especially when kneeling for cleaning low level areas. Adapting the belt to personal or project circumstances significantly reduces the trafficking between cleaning trolley and c leaning location. The belt can be washed at 60 degrees Celsius. In conjunction with utensils and trolleys, optimizing the cleaning process and reducing the trafficking during the cleaning process. Suitable to any project, with exception of locations, where daily disinfection of the belt would be required. Optimal in conjunction with Rekola Reflex concept and Rekola Motion trolleys. Also suitable for other brands and concepts. 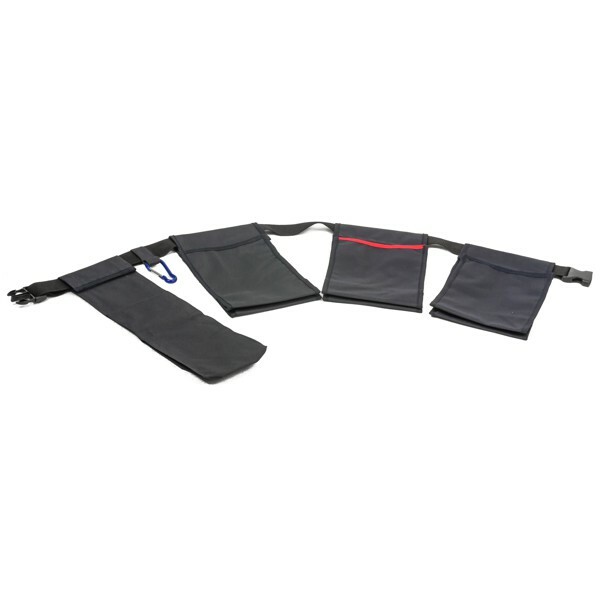 Rekola Addon work belts contains several bags of different dimensions. Each bag is attached to the belt by Velcro so that the belt is easy to adapt to personal needs and cleaning circumstances. The 150 cm buckle belt can easily be adapted to the required length. Fit the buckle belt by pulling on the open end of the belt. Adapt the belt to the personal circumstances and needs, unused pouches can be removed. Wrap the modified belt comfortably around the hips and close the buckle. Release the buckle of the belt. Do not leave your personal possessions in the belt when storing. The Rekola Addon work belt reduces the trafficking to and from the cleaning trolley during the daily manual cleaning process. The belt can be washed at 60 degrees Celsius and air dried. Remove the aluminium carabiner before washing to avoid corrosion. Do not use softener or chlorine bleach products as this will affect the lifetime of the product. All parts can be reused or disposed of in energy generation programs. Polyester knitted belt 150 cm with Polypropylene buckle lock. Polyester 600D Oxford fabric pouches with Velcro attachment to belt. 2 pcs blue coded and one pc red coded, plus one pc long pouch for duster or garbage bag-roll transport. EVA pouch Article 10-900112 or 10-900111. Stainless steel hook for hanging utensil Article 10-900121. The work belt is an Addon product optimizing the work flow between cleaning trolley and the surfaces to be cleaned. Enabling the worker taking different color coded cleaning cloths, a spray bottle and a roll of garbage bags into a room at the same time. This significantly reduces the trafficking percentage of the cleaning process (average 5-8%). The adaptable segments make the work belt also comfortable for employees of differing heights, especially when kneeling for cleaning low level areas. Reduction of the trafficking also includes reduction of the mileages that employees have to walk every working day. The belt is designed for low weight transports; avoiding back strain. The buckle belt can be adjusted to the comfortable dimension of the user. Rekola Addon work belt with buckle lock 425 grs.